I started a new book today, pictured above. Also pictured, the lovely flowers my sweet husband brought home. They are a breath of spring, much needed because another snowstorm with bitter cold and brutal winds is bearing down on us. In other words, a good day to stay inside by the fire and read. So of course, we didnt. We did an 18 mile run in snowmobile trails. Now it feels even better to be cozy inside sometimes you cant appreciate the warmth unless you have had to be out in the cold. How To Grow More Vegetables than you ever thought possible in less land than you can imagine. Jeavons proposes the bio-intensive method of gardening, aiming always toward a sustainable, natural way of doing everything. I will share some highlights as I read, but here is a quote from the Introduction that mirrors my own philosophy and is the reason we want to get this little homestead up and running. "We "farm"as we eat. If we consume food that has been grown using methods that inadvertently deplete the soil in the growing process, we are responsible for depleting the soil. It is how we are "farming". If instead, we raise or request food grown in ways that heal the Earth, then we are healing the Earth and its soils. Our daily food choices make the difference. We can choose to sustain ourselves while increasing the planet's vitality. In the process, we preserve resources, breathe cleaner air, enjoy good exercise, and eat pure food." I will add that these resources are limited. We only have one planet. This is our chance to do our part in preserving it for our children's children. They're making more people every day, but they aint makin' any more dirt. Weather. Minus 6 this morning. Snowing now. Temps will likely dip into single digits. It is 12 right now and dropping. Windchills tomorrow in the double negatives. We have, on three sides of the porch, three feet deep raised beds. We just started these last year. In these were cherry tomato (trained up on the porch) kale, oregano, ramps, peas, lettuce, butternut squash-the squash was able to leave the raised bed and go all over the yard. The raised beds really worked well.I have to rethink what goes into them this year-like maybe just *one* cherry tomato plant. I am really liking the book so far. 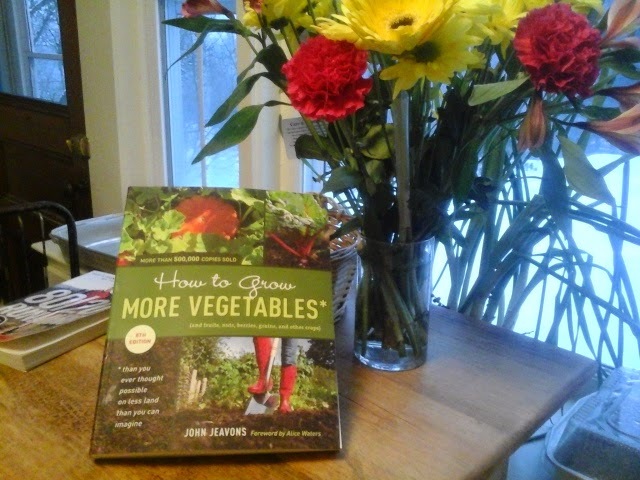 It might become my gardening bible!